In business since 1993, Brian Murphy Precision Engineering has built-up a vast knowledge and experience in hydraulic solutions and projects for individual customers through to multi-national companies. Brian Murphy Precision Engineering will provide cost effective solutions to all your common Hydraulic Ram Repair and Hydraulic Cylinders problems. With the experiance we have built up over seventeen years in business we can usually advise companies the best way to go with their hydraulic project and the quickest way to solve a problem. 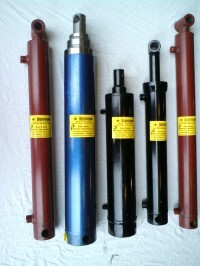 You can be assured that your replacement hydraulic part will be engineered to the highest standards. Fully equiped engineering workshops equipped with Computer Aided Design / Computer Aided Manufacture (CAD/CAM) and Computer Numerical Controlled (CNC). We maintain large stocks of chromium plated piston rod material, cylinder tubes and hydraulic seals from the best suppliers in the industry. All materials used for remanufacture are exactly the same as those used in the original hydraulic ram manufacture. Please contact Brian Murphy Precision Engineering Ltd for the best hydraulic advice. The type of company/customer we deal with can vary from multinationals to individuals needing a hydraulic ram repaired. In the case of the large companies, if it's a new customer, the first contact could be for them to telephone and ask us to go and look at the job/problem. Or they sometimes just bring the job to us and explain what they need. When your hydraulic ram is received for repair it will be assessed and we will provide a quotation for the work. You will then receive a the quotation and time scale for completion of the work, for your approval. Most companies now want a quotation before any work is done. We always give a quote, even to the companies that don't look for one. That way everybody know where they are, and it avoids arguments after the job is complete. With our established customers; repeat orders are usually by fax or e-mailed order. We manufacture parts for machines or wearing parts that need to be replaced regularly. These are ordered for stock in some businesses. 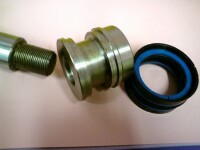 So after we manufacture we deliver in to them, complete new parts ready for use. With the individual customer. The jobs here can vary from a part broken on a farm machine, to an person designing something and needing a specific type of hydraulic ram manufactured. We can advise on size and type of ram and then make this to the agreed specification. Again we insist on pricing before we start the project.